This tutorial shows how to run MobileInsight inside the phone. Currently MobileInsight supports Android phones with Qualcomm™ and certain MediaTek™ chipsets. This link lists the phone models we have tested. Besides, you can also run MobileInsight on desktops. Download MobileInsight apk here, and install it. Alternatively, you can download the source codes from our GitHub and build an apk by following the instruction here. MobileInsight needs the root privilege on Android phones. RrcAnalysis: A simple analyzer for 3G/4G radio resource control (RRC) protocols. NasAnalysis: A simple analyzer for 3G/4G mobility and session management protocols (Non-access stratum or NAS). For some phone models, you may need to run MobileInsight in special boot mode. For example, for Nexus 6/6P, please boot your phone in baseband processing mode (e.g., see this link on how to do it). Note that most phone models do not need this step. Please try it only when MobileInsight reports warnings. Alternatively, you can write your own plugin. 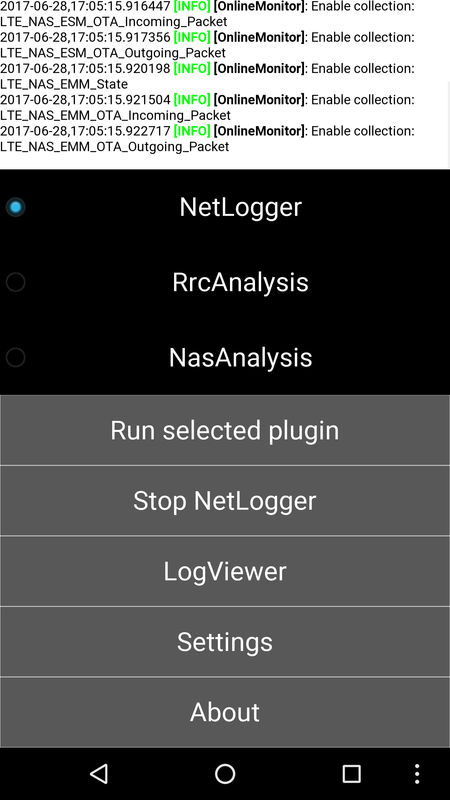 You can go to Settings to change the default setting for each function, and use LogViewer to view stored cellular logs. Learn how to write your own plugin and run it inside the phone. Learn how to use MobileInsight on the desktop for offline analytics.